A one-eyed, brown cat. and rhyme so tight a reader is roped into fanciful beliefs, or memories of a past when life and fear seemed huge, simple and quick. I am sorry regret it took me so long to discover Rick Felty’s writing. The three-book, early reader series about Tab itha Fink yielded a book each year since 2015. I am overjoyed, now to be caught up. The stories filled me with admiration as a children’s author, and as a reader let me see the world again like a wide-eyed kid. The most recent work, Tabitha Fink: Ninja at Night, proves that a story told well in rhyme can bring a smile and even anticipation to adults. Readers will see the author’s progress through the narratives. His first book, Tabitha Fink The Cat With One Eye, is less clever in its prose and scenario. In the dedication of his third book, Felty talks about his stories as a “journey of discovery.” That is the most apt description of the way the word play appears in the 45-page work. I imagined youngsters’ fascinations with those simple unadorned sentences. The words have a blunt feel that hit the mind with a clarity that offers a moment-to-moment I get it! There is a completeness in the main character’s description that ushers listeners and readers into familiarity with the feelings and a desire to almost reach out and pet the furry hero. Felty, who is an Emmy-winning television producer, writes prose so lyrical that the smooth word play pulls a reader into the tale. At some points wildly alliterative in the ways of a Dr. Seuss or Shel Silverstein, Tabitha Fink The Ninja at Night has a conflict that appears so trivial. Tabitha’s mouse playmate Bartholomew Blink is stalked by a slew of night terrors – a big furry monster, an evil witch, a dragon, some blue bears, and a smelly troll. Yes, the problem is simple, but Tabitha’s struggle tugs at the memory. The unique character modeled after his family pet is pushed into the eerie situations that seemed a big deal when I was a kid. I began to recall what it felt like to face fear of the dark. – in the lack of light, and Felty’s cyclops hero confronts her friend’s fright as a ninja with a flashlight. Tabitha Fink books are the kind of imaginative and fanciful explorations that children scream for at bedtime or story time in school. Felty’s clever use of language and plot sets a pleasant diversion for adults, too. Before I was aware, page after page flipped as I rushed to see the ninja’s deeds. At the last of 68 pages, like Bartholomew the mouse, I was satisfied by the charming conclusion of the darkness dilemma. As many readers, I was only disappointed that I might have to wait another year for more. high school students on the way to timely meet attendance on the first day of school. In an hour or so, the elementary school kids will follow. Like clockwork, every school day, I watch the faces as young people of all sizes move past me. Some are on foot. Some ride bikes. Book bags are on their backs. I barely still remember when I was one of them. Full disclosure – I liked school from the first day of kindergarten to college. I cannot fully recall everything that happened on the first day of school in those years. Memories grow faint, but the sense of curiosity and anticipation never fade. 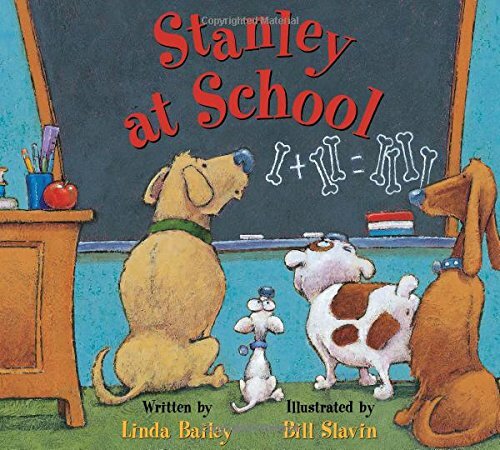 Those elements are guaranteed to stir some of the same feelings in those who read, or listen, to the fast-paced action in award-winning Canadian author Linda Bailey’s delightful picture book, Stanley at School. Anyone who thinks that praise is just hype should give the 32-page work a read. I won’t share much of the story, because you really have to hear the tale for yourself. In fact, the way the author uses words is the first remarkable aspect of the book. First, let me be candid. When I first saw the title and read the description for this work, I was intrigued yet unimpressed. Several authors have written read-aloud books about dogs (or other animals and creatures) going to school. A standout is Ree Drummond and Diane deGroat’s tale of how Charlie the Ranch Dog makes it in a classroom. Several audience polls rate in slightly higher than Norman Bidwell’s classic Clifford’s First School Day. On its face, Stanley at School, seemed too close in theme and content to Constance McGeorge’s nicely written, Boomer Goes to School, published in 2012. That is why it pays to look beyond the cover. ‘What do we do now?’ asked Alice. But she already knew the answer. All the dogs knew. They had to wait outside. And that is when Stanley got an idea. A big idea. A bold idea! An idea so daring it made his fur stand up. Happy but embarrassed to admit I was right there in the conversation with those dogs. More than that, award-winning Illustrator Bill Slavin’s vibrant drawings make the scene more believable. His image of the closed school doors up a long flight of stairs not only gives the reader an insight into a dog’s vantage point. I could imagine how a three- or four-foot child might similarly see the setting. Parents who want to slake the interest of a preschooler, or ease the jitters of someone in kindergarten, will find Stanley a great resource. Even readers like me, who have not answered the school bell for a half century will smile, laugh and at some points guffaw, at the tightly woven tale. Those familiar with Bailey’s five earlier Stanley books will attest, the goofy, yet adventurous character strikes something beautiful in the core of many people. Bailey, who is head over heels for her Golden Retriever Sophie, asserts that Stanley is “the dog I would love to be.” That spirit also infuses the narrative, you will see. It is obvious that I enjoyed the experience, but some of the pictures seemed out of sync with the text. In a couple places the text came on a page after the drawing. I read an e-book, and even went into two-page mode to see if the alignment changed. It did not. I was distracted. Nonetheless, a clever narrator, can hold the image in order for a child. Well, let Stanley at School take you back to that first day when you thought the worst nightmare lay behind a school door.